The optimization of your phpBB 3 board can be performed by many ways, however before you can begin with this procedure you will need to analyze the resource consumption of your board and of course to check its loading speed. This can be easily achieved if you look at the resource consumption of your board via your cPanel > Resource Consumption and also if you test your Board via some of the online speed checking tools. Assuming that you have received not satisfying results from these checks you will probably want to optimize the loading speed and in this tutorial we will show you few techniques for doing so. First technique we will present you with is related to the optimization of your database. Since your database is the main storage unit where all of the forums, posts, user information and configurations are stored you will need to determinate if its size is too large and what generates this size. 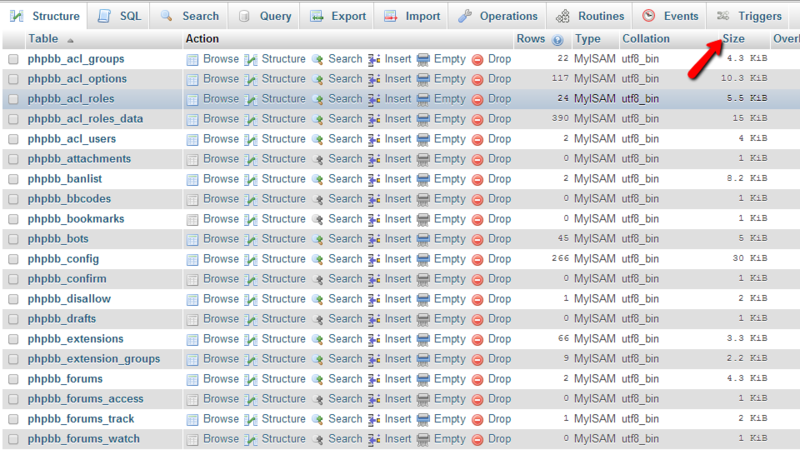 You can perform that via the phpMyAdmin feature of your cPanel. There, once you access the database you will be able to sort the tables of your database by size in order to determinate which from the tables are with the most largest size. Usually if you have spam posts on your Board you will notice how the *_posts table will be probably largest. In such case you will need to remove the spam posts and reduce the size of that table. 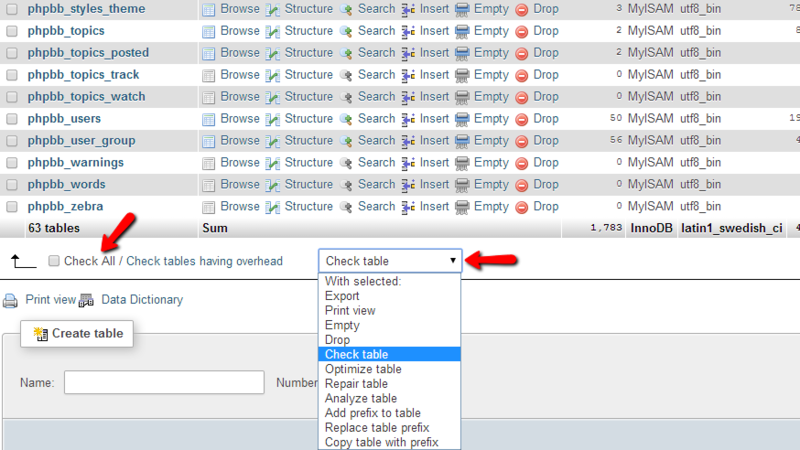 In order to run these you should select all of the tables in your database and scroll down to the bottom of the tables view page where you will find a drop-down menu called “With Selected”. There you will find the mentioned scripts. You should do that action for each one of these procedures – selecting all of the tables and then selecting the procedure. Now that you have your database optimized it is time to optimize the loading speed of your website by enabling few server side features. The first feature is called Leverage browser caching and it is related to setting an expiry date or a maximum age in the HTTP headers for static resources. This action will instructs the browser to load previously downloaded resources from local disk rather than over the network. In simple words you will allow your users to cache the static contents of your website on their local computers which will allow these resources to be loaded from there instead downloaded each time they access your phpBB 3 Board. These direct instructions will tell the browsers to cache the listed resources for period of 1 year. In this step we will discuss some other additional optimization techniques which are commonly used on VPS/Dededicated Server solutions as the shared hosting environment will not always allow these. Where the “phpBB3_installation_folder” is the folder where your phpBB3 installation is located. The file should be named the same way as the above URL suggests - acm_memcache.php. This will tell your board that the Memcache apache module is installed and it can begin using it.